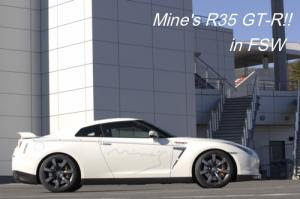 "The Mine's GT-R has a Mine's rear wing, suspension kit, titanium exhaust pipe with catalyzer stabilizer, full brake kit with rotors, VX air filter and the Mine's VXROM computer chip that is the core of their technology. Upcoming still in development are aero parts like the mirror, hood, front canards, carbon front spoiler and side outlets. We can't imagine how fast this thing will go with all of these parts fully installed. " This same car should be on its way to the US shortly. I wonder why they are sending it here ? Well, actually, I know why its coming, but...can't say. You guys guess in the commments. Testing at Laguna Seca perhaps? Niikura san wants to go through McDonald's drive thru...in reverse! Ha! Niikura san want to go through the McDonald's drive thru...in reverse! Ha! 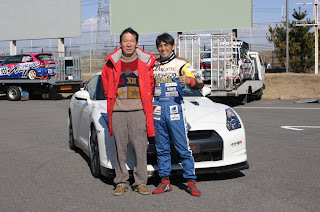 HMMMM COULD IT BE SUPER STREET TIME ATTACK? try to set a new record from la to ny? To anounce its sale in the US?